The blood injected in the left ventricle of the mouse heart results in a vortex pattern just as in humans. Doppler ultrasound is a well established clinical technique to measure blood flow in humans. The method makes use of the Doppler effect to detect small changes in position over time. It is used extensively for cardiovalscular evaluations to detect abnormal blood flow conditions. Traditional Doppler is used either to detect the presence of blood or to assess flow conditions in blood vessels where the flow is more or less steady. Traditional Doppler is only able to assess the flow in the direction normal to the transducer or essentially in the direction that the ultrasound propogates. To estimate the flow velocity that is not in the normal direction, an estimate must be made of the angle between the normal direction and the flow direction. Traditional Doppler is not very effective when trying to image complex flow patterns such as those found in the heart where vortex patterns are formed. In recent years, advances in ultrasound equipment and computational power have permitted the detection of flow patterns through estimates of local flow vectors using Doppler and other approaches. 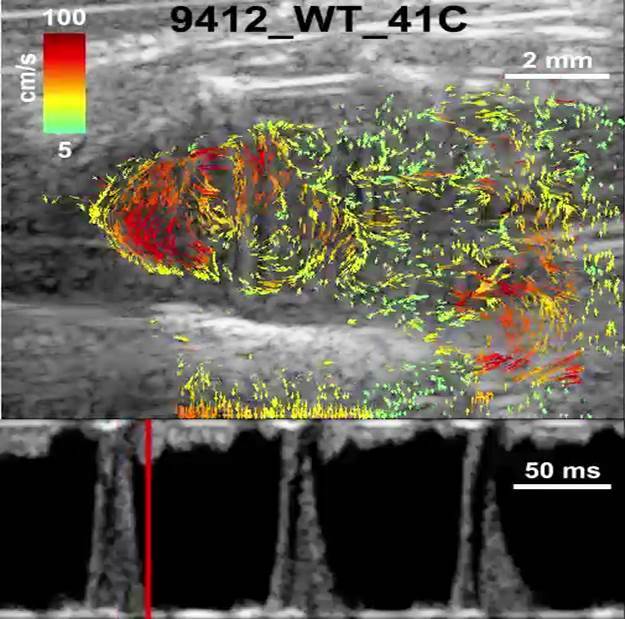 The methods have been used on humans and the equipment required to perform this type of blood-flow imaging is becoming more widespread and clinical applications are slowly emerging. Mice are used extensively for cardiovascular studies because many diseases in humans are represented in mouse models. Specialized ultrasound equipment is available to perform Doppler studies on mice. The main difference between the equipment for humans and the equipment for mice is the operating ultrasound frequency. Humans require around 10 MHz frequencies and mice upwards of 20 MHz. Because of this, the vector-flow methods applied to humans have not yet been adapted to imaging mice. 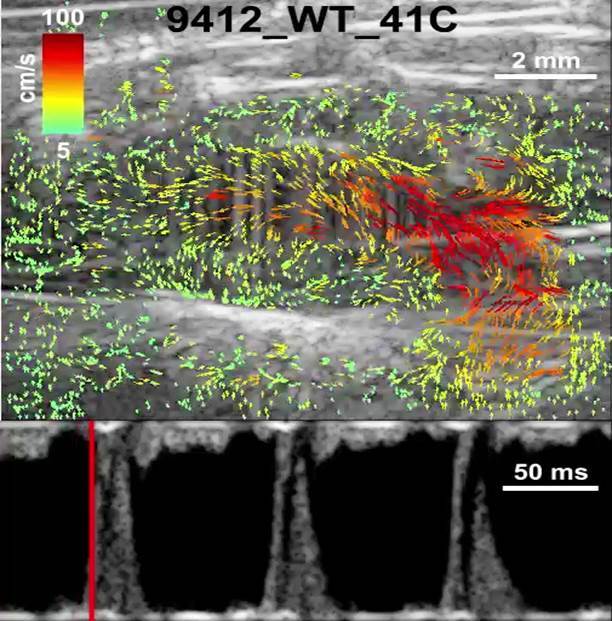 The ability to apply the vector-flow approaches to mice would allow for direct translational studies that would facilitate understanding how the complex blood flow patterns in the heart related to healthy heart function. We undertook initial studies to obtain vector flow information from the left ventricle of a mouse. Data were acquired transmitted ultrasound at an absolute rate of 30,000 frames per second. The effective frame rate after processing was 10,000 frames per second. In terms of flow, the maximum velocity that can be resolved before aliasing in the direction of the ultrasound was 21 cm/s. A video clip [movie] showing 3 hearts cycles, spanning 300 ms, is shown. The flow is indicated by vectors that point in the direction of flow and are colored based on the flow velocity. Over the heart cycle, the left ventricle can clearly be seen filling via the mitral valve [Fig 1] before developing a vortex pattern [Fig 2] and then the blood is ejected through the aortic valve. These initial studies show that the sophisticated methods used to image cardiac mechanics and hemodynamics in humans can be translated to mice. Having similar tools for mice and men will assist in developing applications using vector flow and for understanding fundamental properties of cardiovascular function as they relate to blood flow, mechanics and the related forces between the two. Figure 1. (mitralinjection.jpg) Blood flow into the left ventricle through the mitral valve. The flow velocity is near 100 cm/s. Doppler spectrogram from a region near mitral valve. Figure 2. (vortex.jpg) After the mitral valve close, a vortex pattern has developed prior to ejection of the blood in the left ventricle. Here can be inserted movie, that shows several heart cycles and the blood flow patterns. B. Y. S. Yiu and A. C. H. Yu, “Least-squares multi-angle Doppler estimators for plane wave vector flow imaging.” IEEE Trans Ultrason Ferroelectr Freq Control, vol. 63, no. 11, pp. 1733–1744, 2016.